Wolfgang Amadeus Mozart, composer, violinist and piano virtuoso, was born on January 26,1756 in Salzburg, Austria and died on December 5, 1791 in Vienna, Austria. Mozart’s works are identified by Köchel numbers (pronounced “Kershel”), named for the Austrian musicologist Ludwig Köchel who, in 1862, published a numerical list of Mozart’s works in the order in which they had been written - i.e., K. 1 was the first piece Mozart wrote and K. 626, the last. While in Mannheim, in late 1777, Mozart received a commission for several Flute Concertos (for flute and orchestra) and Flute Quartets (for flute and string trio - violin, viola and cello) from a wealthy amateur flautist, Ferdinand Dejean (1731-1797). Unfortunately, our knowledge of much of Mozart’s flute literature, exactly how many flute concertos and flute quartets he wrote, rests on the information contained in Mozart’s letters to his father and Mozart wasn’t very consistent: in December, 1777 he reported 3 concertos and a couple of quartets; at the end of January, 1778 the number of quartets had increased to 4; February, 1778, it was 2 concertos and only 3 quartets; in July, 1778, only 2 quartets; but in October, 1778, again it was 3 quartets. Most modern scholars agree on 4 Flute Quartets (2 from this period in Mannheim and 2 from later in Vienna) and 2 Flute Concertos - Andante in C Major (K. 315) was supposedly written as a replacement for the 2nd movement of Flute Concerto No. 1 in G Major (K. 313) - because Dejean found the original 2nd movement too difficult. At that point Mozart began to lose interest in the commission and for Flute Concerto No. 2 in D Major (K. 314) simply transposed to D Major an already existing Oboe Concerto in C Major (K. 271k) written in 1777 for Oboist Giuseppe Ferlendis (1755-1810). This caused Dejean to become angry with Mozart and refuse to pay the commission - contributing to Mozart’s alleged dislike of the flute. In March 1778, while in Paris, Mozart met another wealthy amateur flautist, the Count of Guines (1735-1806), whose daughter was an excellent harpist; Flute and Harp Concerto (K. 299) was written for them in April, 1778 - one of the few commissions received by Mozart while in Paris but for which he also was not fully paid. The purpose of Mozart’s 1777-1778 trip had been to try to secure a position somewhere in Europe other than Salzburg, where he felt his talents were wasted; not only did he not receive any offers for a position, his mother died while they were staying in Paris in 1778. Although not very difficult, the Four Flute Quartets are rarely played by High School Flute students because of the necessity of 3 string players (Violin, Viola and Cello) and because of the unfriendly keys employed: A, D, G & C - keys not often seen in school band. 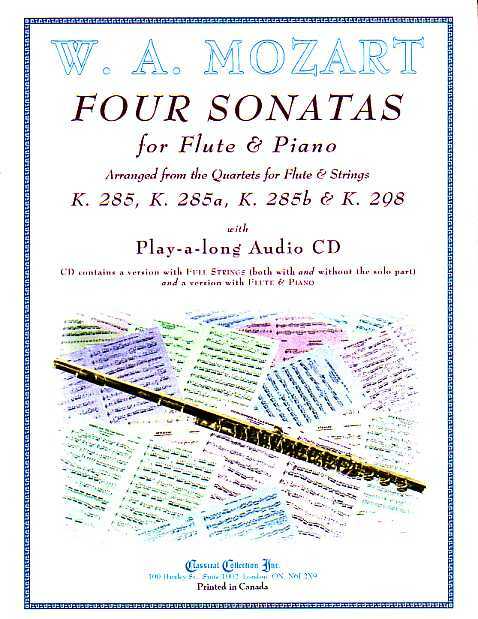 These Sonatas were “created” by transposing the Flute Quartets up a tone or semitone in order to put them into flat keys, and then arranging the String Trio parts for the Piano. Some meters were also changed to avoid the use of sixteenth or thirty-second notes.